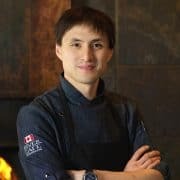 A born and raised Calgarian, Matthias Fong’s interest in the culinary world lead him to seek employment at River Café while completing his studies at the university of Calgary. He graduated with a Bachelors of Arts in Sociology, developing a profound appreciation for the study of food, both academic and pragmatic. After working overseas, he returned to River Café in 2012, realizing the potential for development of Canadian cuisine. His focus developed around the extensive exploration of seasonal sustainable ingredients of the prairies and Canada, but especially those from the gardens surrounding the restaurant. Matthias’ cooking is inspired by food related books and developed flavor memories. He draws culinary techniques from various cultures to inform his cooking through a contemporary lens. Recent recipient of University of Guelph Good Food Innovation Award 2017, inclusion in the publication ‘1001 restaurants to experience before you die’, Silver medal at Gold Medal Plates competition in support of Canadian athletes, Avenue magazine & Where magazine best restaurants, and 29th Canada’s Top 100 Restaurants.